Google has reported that since 2011, ‘near me’, ‘closest’ and ‘nearby’ searches have risen by 34x. Most recently, ‘near me’ searches spiked to the 100 value on Google Trends for the first time. The spike indicates that we have reached our search-intent peak thus far for these types of searches and should likely continue to see volume rise. Google, Facebook, Bing and Yahoo are continuing to make enhancements to their product to promote localized search. Google recently announced that advertisers utilizing Location Extensions will automatically be incorporated into Google Maps. As digital marketers, it’s our job to ensure that we are building a strategy to compliment this trend. Below are 5 unique ways to make sure you’re starting-off on the right foot regarding localized search from an omni-channel perspective. Step one is ensuring that you have built and synced your Google My Business into your AdWords account. When a user is near your business, it will show all the company details right in the ad copy. You can also tag your phone number so that you can measure the amount of calls derived from location extensions. If you’re a golf fan, this one is what we call a “gimme”. Google has a couple different offerings here in terms of location targeting- from City to Zip Code to Radius. Not only do you want to apply appropriate targeting, but you want to ensure your targeting settings are set-up properly. Ensure that you’re only targeting people in your targeted location for your hyper-local campaigns. very careful with your strategy to ensure you’re leveraging this opportunity in the most appropriate fashion. At FWRD, we typically recommend breaking-out Mobile vs. Desktop campaigns for ‘near-me’ searches to measure the attribution between the different devices and help control budgeting (pushing more to mobile). Our main KPI in this campaign is to drive in-store volume; however, we will want to look at how this campaign affected our account as a whole via attribution methods. 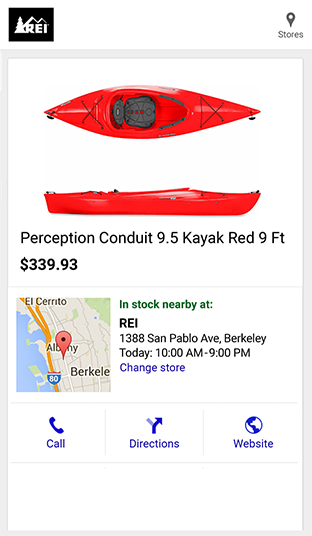 This relatively new product allows users to search for product availability in nearby stores via Google Shopping. Instead of having the purchase online, the user then has the option to pick-up in store. In order to capitalize on this, you need to build a local inventory feed. This is where Facebook, Display, Search and Shopping come together very nicely. Tag each tactic with a special ‘localized’ UTM parameter and start to play around with remarketing efforts across your platforms. For example, if you’re running Localized prospecting on Facebook, set-up a UTM parameter that you can then leverage via remarketing audiences in Search- and visa-versa. Micro-moments and being there for all touchpoints throughout the users journey can turn an online window shopper to a lifetime customer. Join in on the revolution with the Search and Social giants and start to build your localized, full-funnel digital campaigns now. How are you optimized for local search? Will I Be Your Valentine? In March, Alexa found herself in the media spotlight for an odd reason: laughing.